High-grade fire clays can withstand temperatures of 1775 °C (3227 °F), but to be referred to as a "fire clay" the material must withstand a minimum temperature of 1,515 °C (2,759 °F). Fire clays range from flint clays to plastic fire clays, but there are semi-flint and semi-plastic fire clays as well. Fire clays consist of natural argillaceous materials, mostly Kaolinite group clays, along with fine-grained micas and quartz, and may also contain organic matter and sulphur compounds. Fire clay is resistant to high temperatures, having fusion points higher than 1,600 °C (2,910 °F), therefore it is suitable for lining furnaces, as fire brick, and for manufacture of utensils used in the metalworking industries, such as crucibles, saggars, retorts and glassware. 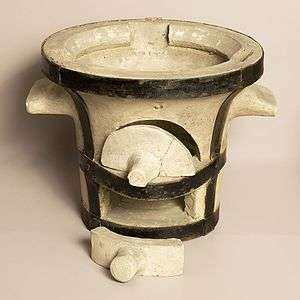 Because of its stability during firing in the kiln, it can be used to make complex items of pottery such as pipes and sanitary ware. The chemical composition typical for fire clays are 23-34% Al2O3, 50-60% SiO2 and 6-27% loss on ignition together with various amounts of Fe2O3, CaO, MgO, K2O, Na2O and TiO2. Chemical analyses from two 19th-century sources, shown in table below, are somewhat lower in alumina although a more contemporary source quotes analyses that are closer. Unlike conventional brick-making clay, some fire clays (especially flint clays) are mined at depth, found as a seatearth, the underclay associated with coal measures. 1 2 Minerals Zone, World Mineral Exchange. Retrieved 2011-6-23. 1 2 Thorpe, Sir Thomas Edward (1890). A Dictionary of Applied Chemistry Volume I. Longmans Green & Company, London. 1 2 King, William B. (1878). King's Treatise on the Manufacture and Distribution of Coal Gas. self. 1 2 Shackelford, James F (2008). Ceramic and glass materials: structure, properties and processing. Springer. p. 121.